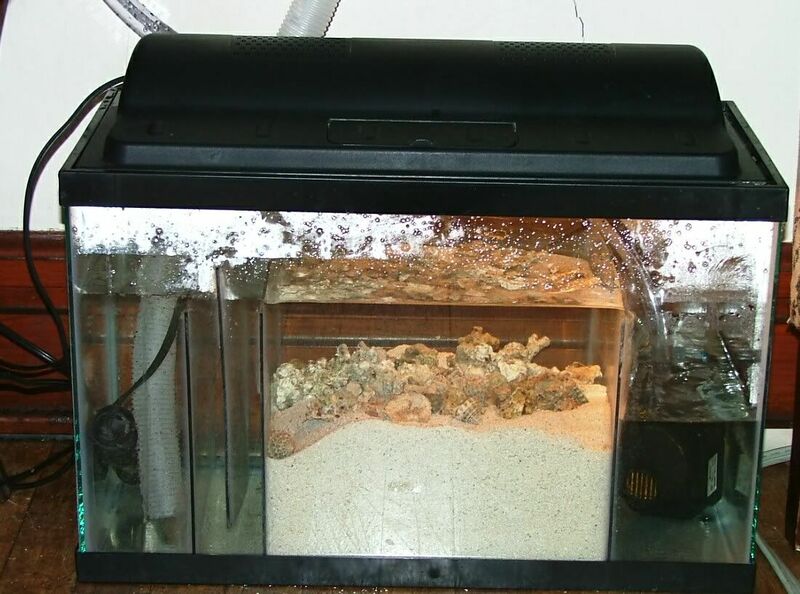 I am posting this here (again) under a separate title, to induce more discussion on sand in marine tanks; my previous post was deleted, please advise if you are deleting my posts, many thanks. I do not want to limit the discussion only to beach sand, which was the previous topic. I am attempting to induce opinions on the wider issue of all sand options. Home Depot sand, silica sand, beach sand, pink sand, live sand, dead sand, shallow sand, deep sand and even deeper sand. I see a lot of references to sand these days... entire sections of some sites are dedicated to it. IMHO, the jury is still out on using sand for marine fish set ups. I have spent a lot of time looking at this on many sites and there is clearly a lot of confusion, differing opinions and questions regarding the sand issue. Some are claiming their deep sand beds are becoming magic nitrate reducing machines, others are watching the DSB suddenly turn into a hydogen sulphide bomb or algae-fest. Some very reliable sources claim the sand should be sifted and maintained, others insist the sand should be layered and never disturbed. Some prescribe a plenum under the sand, others have seen their sand turn into solid concrete when their water chemistry strayed. Some call deep sand "mud" and suggest it will cure HLLE in your fish, others claim sand should not be used for marine fish tanks at all, esp. those with moderate to robust fish populations. It's no wonder we have such a high failure rate in this hobby. As usual, I am seeing a lot of confusion and mixed advice based on A:fish only, B:FOWLR, C:true reef system experience. My advice is; be careful with sand... be careful using mixed advice which often produces failure. 1/2 advice from source A and 1/2 advice from source B will produce a "hybrid" system which has no proven track record or limited long term results. Research the systems you are seeking to mimic; when you decide on the best system, sand, plan, etc. then stick with it, but make sure the template has long term success and make sure you are following the pattern closely and not leaving out an important part or straying from the intended goals. (for example trying to maintain a moderate to heavy bio load using a filter designed for sparse populations). As more and more hobbyists succeed and fail with sand perhaps we will all learn... but again, use caution; I remember not long ago when trickle filters were touted as the silver bullet to all our problems. I'll join in...as a newbie still learning. I have spent the last year reading everything I could find and lurking sever salt forums. I decided to finally set up a small tank...just a 29. FOWLR for the moment. I added a 10 gallon tank as a fuge with overflow box and two DSB's, one in the main tank and one in the fuge. From my research this has a proven track record as long as the dentrivores are allowed to breed and thrive. I could have easily bought a skimmer, and still may, but only if the dsb's don't perform the denitrafication. My research has indicated that it will, and remain stable. This tank is an experiment for me. If I can do this in a 29 (35 if you count the fuge) then I will expand it to a lrger system. Plenums seem to have limited long term success, UGF's work but seem to require a lot of maintenance, skimmers are a great idea...if used properly. I am not a fan of skimming yet, to me it is a band aid approach to removing waste and the thought of removing the good stuff in the water doesn't appeal to me. Overskimming can be a problem in my opinion. For my DSB's I used 3 sizes of sand and will let the creatures in the sand do the size sorting for me. Both DSB's have been seeded from friends DSB's and are set up and running. Here are some pics of the fuge I set up, as I built it. Images are too large for the board, so here are the links. 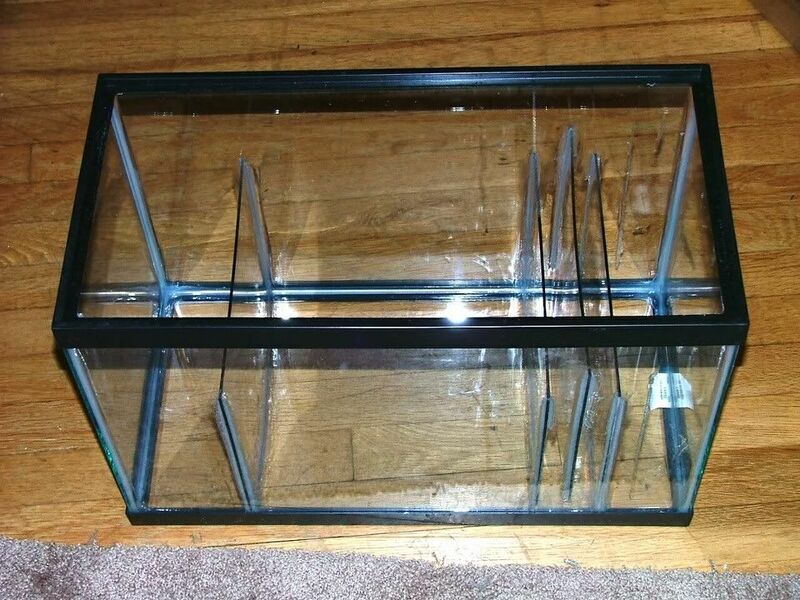 Basic 10 gallon tank, Lexan dividers and silicone. Images are too large for the board, so here are the links. Tank filled with about 5" of sand and operating, Rubble and sand added from friends tank. Fuge finished with a few varieties of live plants and some nice free Featherdusters which will reside in main tank. Main tank...still working on rock arrangement. Lots of reflections...I will try and get a better pic tonight. We will see if the DSB's perform long term. Ahhh, very good post. This is great. 1. What are you using for heavy waste/nutrient export? 2. are you using a hang on bio filter? 3. Is your plan to stir/sift or not disturb the beds? 4. Do you have heavy water movement? 5. Are you planning on cultivating the coralines and rock with lighting, kalkwasser etc. or letting them decline? 6. Can you list all the equipment used, lights etc. 7. Was this live sand to start? 8. what is your bioload plan? Not planning on a heavy bioload, a couple of clowns and shrimp, using a Whisper 60 with carbon and Purigen. Whisper, but the foam pads are gone, and will rinse filter weekly to remove large waste. I will let the micro organisms and dentrivores do the sifting, which they can do effectively on their own. 2 90 gph heads behind the rock and a ZooMed Powersweep 214 to keep it circulated, spray bar attached to a Hagen 802 that is in the sump. plus the Whisper 60...it circulates nicely in there. Coralines will be encouraged to grow with a coral builder, currently using Kent Coral Builder which should help keep the alkalinity up, will dose as needed. No, total of 70 lbs purchased sand that has been seeded from friends tanks and from my favorite LFS. There is probably 40 to 50 lbs of live rock in it now, I lost count, lol. Bioload will be light for a while, a couple of clowns and shrimpand cleanup crew to start with. If it stays stable I will probably add a couple more fish. 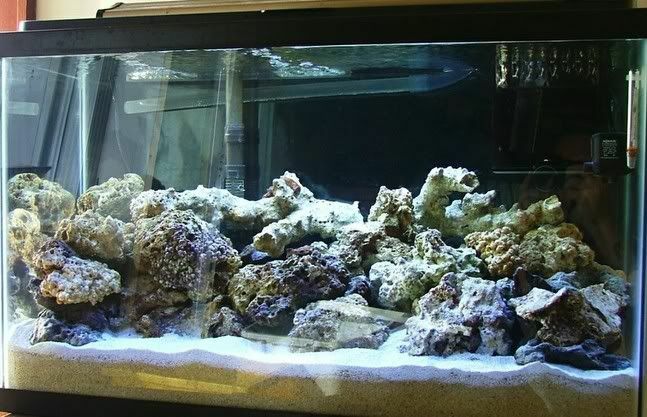 I went over my plan with a couple of trusted saltwater fanatics and they seem to think it is sound and one actually has a tank set up close to mine and it has worked for him for over a year, but his tank is bigger, lighting is Halides and fuge is same size as main tank, 75 gallons, but his bioload is much greater than mine gallon to gallon. I think the key to success will be the dentrivores and weekly water changes. People have kept salt tanks for many many years before skimming became the rage. I don't feel in a tank this size I need to skim, small bioload, plenty of "natural" denitrifying methods and good housekeeping practices will keep this tank healthy. I guess time will tell. Thanks for the many details, others will benefit... you're on your way now, sounds like you have a plan and something worth trying. I normally keep larger fish only tanks with robust bioloads requiring more filtration/skimming etc. Also still feel keeping fish and invert "gardens" together will create long term problems with parasite irradication; I cannot imagine a practical solution if you have multiple prized, high dollar fish being attacked by a cryptocaryon army residing/growing in a massive sand bed. I realize many keep fishes quite succesfully in true reef tanks, but way too much of a headache to be relaxing for me. I read an article some time ago about a hobbyist who--despite doses of garlic and other reef safe chemicals-- slowly watched his beautiful fish collection decimated by parasites in his giant reef tank because he couldn't catch/move them all and he couldn't add copper to his reef. When you are keeping 20.00 clownfish that's bad enough, but when your fancy is 150.00 tusk wrasses and blue faced angels it's another issue. This is one reason why most reef tanks have sparse fish loads and there are no inverts in the huge public aquarium systems; it simply isn't practical. However, I am very interested in the refugium aspect, it may be that a heavily planted/LR remote fuge with DSB (such as yours) will become a big part of the marine fish hobby. If parasites invade, the fuge can be dissconnected to protect the inverts. Some live rock could be moved there during treatment. Benefits would be denitrification and additional DOC removal from the plants. Best wishes with this experiment, please keep us posted. Well I got a skimmer tonight. it is a used AMiracle PS-3, told myself I wasn't going to use one, but for 10 bucks, I couldn't pass it up. It is making foam after a few hours and foam is rising up the tube nicely. Not sure if I will continue to use it, as my water parameters have been good, but the nitrates have risen to 10ppm which is more than I wanted. The tank is still new, so that is expected I guess. The DSB has a lot of life in it already...lots of crawling bugs, 8 tiny featherdusters which hitch hiked with the plants. I have not got the dentrivore kit yet...may not if things stay stable . No Chaeto as of yet, just the Kelp and the unknown plant. The Chaeto will help the Nitrates, but it has been too cold to ship it safely. Bubbles are appearing deep in the DSB which is a good sign...there is life happening there. Ammonia and Nitrites have stayed at zero since the tank cycled. Bio-load is getting up there...1-purple firefish, 1-strawberry psuedochromis (sp?) 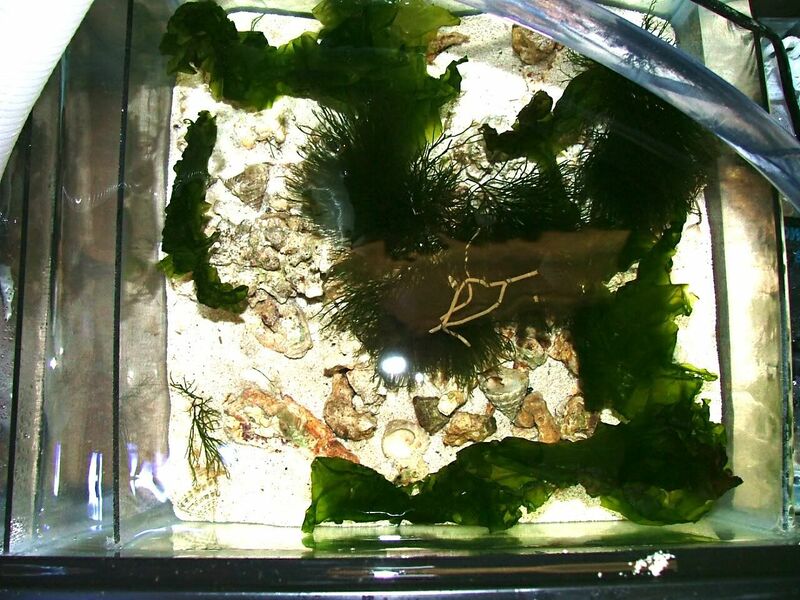 1 small Percula, 2- black mollies, 3 peppermint shrimp, 1-arrow crab, 1-bristle starfish and 3 snails. The Mollies are about ready to migrate back to freshwater. I am surprised to see the Ammonia and Nitrites stay at undetectible levels, but the tank was very heavily seeded at startup. I know this is off topic, but sirreal... do you have some more pics of your tanks?!? I love reef tanks! it isn't a reef setup...but it will probably go that direction someday. Pics are farther up this post...but will keep it updated as time allows.